R7 Clone Review now available! A milestone in Golf Driver technology. The Taylor Made r7 quad, is a remarkable new Driver featuring a completely new technology called Taylor Made Launch Control (TLC). TLC gives players the freedom to change the driver's launch conditions by redistributing 24 grams of discretionary weight in a variety of ways. While the average driver delivers a single set of launch conditions, the Taylor Made R7 Driver delivers six, allowing the player to choose the one that produces optimum results. It's the best driver on the market today. I had always a fade or slice with my old Taylor Made Drivers. When I adjusted the Taylor Made R7 Driver to the proper weighting alignment for my specific swingpath the balls were absolutely straight and very very long. TaylorMade Launch Control, featured in the r7 Quad, gives you the freedom to change the launch angle and spin rate to maximize distance and accuracy of your tee shots in a way never before possible. The first driver to scientifically adapt to your swing, the r7 could be the cure to your slice hook. Combined with Taylor Made's Inverted Cone Technology you gain more than just extra yards and change your game. 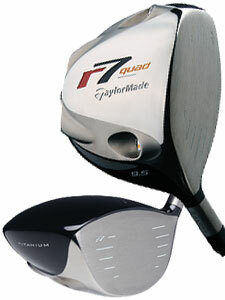 Although the Taylor Made R7 Driver is quite expensive it's a must have for low handicap Players (below handicap 18). Where to get this outstanding Driver at the best price? The Power Play System Q Driver is a new benchmark in titanium driver technologies. The movable tungsten and aluminum weights create customizable launch angles and ball flight options. Six weight configurations give you total control of your game (see the weight setup tool on this page). The System Q includes two (2) six gram tungsten weights and two (2) two gram aluminum weights preinstalled. The position of the weights in the club head determine ball trajectory. This club has enabled me to hit the ball about 20-30 yards longer and perfectly straight. I have never hit a driver to the left before, so I toyed with the weights, and WOW, this thing is GOOD. The Q works like magic. The Power Play System Q Driver is easier to hit than the R7. It can be recommended to all Golf Handicaps below 30. The weight setup control corrects your slice and you can manage higher or lower ball trajection. I personally prefer the Power Play System Q Titanium Driver with 10.5 degree Loft and a Grafalloy Blue Graphite Stiff Shaft.